What happens when you discover that becoming relevant to a community of interest requires profound institutional change? At that point, you have a decision to make about your willingness to restructure your room for this community. 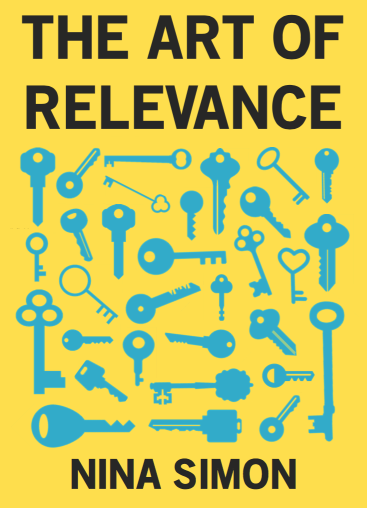 Transformative relevance work is intense. It takes time. It requires all parties to commit. Institutional leaders have to be willing and able to reshape their traditions and practices. Community participants have to be willing to learn and change too. And everyone has to build new bridges together. That’s what happened when the Blackfoot people and the Glenbow Museum worked together over the course of twenty years to repatriate sacred medicine bundles from the museum to the Blackfoot. This story starts in 1960s, though the story of the Blackfoot people and their dealings with museums started way before that. Blackfoot people are from four First Nations: Siksika, Kainai, Apatohsipiikani, and Ammskaapipiikani (Piikani). Together, the four nations call themselves the Niitsitapi, the Real People. The Blackfoot mostly live in what is now the province of Alberta, where the Glenbow Museum resides. Like many ethnographic museums around the world, Glenbow holds a large number of artifacts in its collection that had belonged to native people. Many of the most holy objects in its collection were medicine bundles of the Blackfoot people. A medicine bundle is a collection of sacred objects—mostly natural items—securely wrapped together. Traditionally, museums saw the bundles as important artifacts for researchers and the province, helping preserve and tell stories of the First Nations. Museums believed they held the bundles legally, purchased through documented sales. By protecting the bundles, museums were protecting important cultural heritage for generations to come. Many museums respected the bundles’ spiritual power by not putting them on public display. They made the bundles available for native people to visit, occasionally to borrow. But not to keep. The Blackfoot people saw it differently. For the Blackfoot, these bundles were sacred living beings, not objects. They had been passed down from the gods for use in rituals and ceremonies. Their use, and their transfer among families, was an essential part of community life and connection with the gods. The bundles were not objects that could be owned. They were sacred beings held in trust by different keepers over time. If they had been sold to museums, those sales were not spiritually valid. They were not for sale or purchase by any human or institution. Why had the objects been sold in the first place? Many medicine bundles had been sold to museums in the mid-1900s, when Blackfoot ceremonial practices were dying out. The 1960s were a low point in Blackfoot ceremonial participation. Ceremonial practices had ceased to be relevant to most Blackfoot people, due in large part to a century-long campaign by the Canadian government to “reeducate” native people out of their traditions. Blackfoot people are as subject to societally-conferred notions of value as anyone else. In the 1960s, when Blackfoot culture was dying, some bundle keepers may have seen the bundles as more relevant as sources of money for food than as sacred beings. Others may have sold their bundles to museums hoping the museums would keep them through dark days, holding them safe until Blackfoot culture thrived again. By the late 1970s, that time had come. Blackfoot people were eager to reclaim their culture. They were ready to use and share the bundles once more. Museums were not. Throughout the 1970s and 1980s, Blackfoot leaders attempted to repatriate medicine bundles back to their communities from various museums. Some tried to negotiate. Others tried to take bundles by force. In all cases, they ran into walls. While some museum professionals sympathized with the desires of the Blackfoot, they did not feel that those desires outweighed the legal authority and common good argument for keeping the sacred bundles. Museums held a firm line that they were preserving these objects for all humanity, which outweighed the claim of any particular group. In 1988, the Glenbow Museum wandered into the fray. They mounted an exhibition, “The Spirit Sings: Artistic Traditions of Canada’s First Peoples,” that sparked native public protests. The exhibition included a sacred Mohawk mask that Mohawk representatives requested be removed from display because of its spiritual significance. More broadly, native people criticized the exhibition for presenting their culture without consulting them or inviting them into the process. The museum had broken the cardinal rule of self-determination: nothing about us, without us. A year later, a new CEO, Bob Janes, came to Glenbow. Bob led a strategic planning process that articulated a deepened commitment to native people as key players in the development of projects related to their history and material culture. In 1990, Bob hired a new curator of ethnology, Gerry Conaty. That same year, Glenbow made its first loan of a medicine bundle–the Thunder Medicine Pipe Bundle–to the Blackfoot people. The loan worked like this: the Weasel Moccasin family kept the Thunder Medicine Pipe Bundle for four months to use during ceremonies. Then, they returned the bundle to the museum for four months. This cycle was to continue as long as both parties agreed. This was a loan, not a transfer of ownership. There was no formal protocol or procedure behind it. It was the beginning of an experiment. It was the beginning of building relationships of mutual trust and respect. In the 1990s, curator Gerry Conaty spent a great deal of time with Blackfoot people, in their communities. He was humbled and honored to participate as a guest in Blackfoot spiritual ceremonies. The more Gerry got to know leaders in the Blackfoot community, people like Daniel Weasel Moccasin and Jerry Potts and Allan Pard, the more he learned about the role of medicine bundles and other sacred objects in the Blackfoot community. And that’s when things started to get uncomfortable. Gerry started to experience cognitive dissonance and a kind of dual consciousness of the bundles. As a curator, he was overwhelmed and uncomfortable when he saw people dancing with the bundles, using them in ways that his training taught him might damage them. But as a guest of the Blackfoot, he saw the bundles come alive during these ceremonies. He saw people welcome them home like long-lost relatives. He started to see the bundles differently. The Blackfoot reality of the bundles as living sacred beings began to enter his reality. Over time, Gerry and Bob became convinced that full repatriation—not loans—was the right path forward. The bundles had sacred lives that could not be contained. They belonged with the Blackfoot people. But the conviction to change was just the beginning of the repatriation process. The museum had to change long-held perceptions of what the bundles were, who they belonged to, and how and why they should be used. This was a broad institutional learning effort, what we might call “cultural competency” today. During the 1990s, Glenbow started engaging Blackfoot people as advisors on projects. Gerry hired Blackfoot people wherever he could as full participants on the curatorial team. Bob, Gerry, and Glenbow staff spent time in Blackfoot communities, learning what was important and relevant to them. As Blackfoot elders sought to repatriate their bundles from museums, they also had to negotiate amongst themselves to re-establish the relevance and value of the bundles. They were relearning their own ceremonial rituals and the role of medicine bundles within them. They had to develop protocols for how they would adopt, revive, and recirculate the bundles within the community. Even core principles like the communal ownership of the bundles had to be reestablished. This process took just as much reshaping for Blackfoot communities as it did for the museum. The museum and Blackfoot leaders had to negotiate multiple realities. They had to negotiate on the province’s terms through legal battles and written contracts. They had to negotiate with museum staff about policies around collections ownership and management. They had to negotiate with native families about the use and transfer of the bundles in the community. In each arena, different approaches and styles were required. The people in the middle had to navigate them all. But they kept building momentum through shared learning and loan projects. By 1998, the Siksika, Kainai, and Piikani had more than thirty sacred objects on loan from the Glenbow Museum. They were still fighting for the province to grant the possibility of full repatriation. Still, even as loans, some bundles had been ceremonially transferred several times throughout native communities, spreading knowledge and extending relationships. Glenbow staff had learned the importance of the bundles to entire communities. Native people were using, protecting, and sharing the bundles. Even the Glenbow board bought in. The museum had become relevant to the native people on their terms. The native people had become relevant to the museum staff on theirs. They were more than relevant; they were connected, working together on a project of shared passion and commitment. In 1999, they put their shared commitment to the test. It became clear that they were not going to succeed at convincing the provincial cultural officials of the value of full repatriation. CEO Bob Janes went to the Glenbow Board of Trustees and told them about the stalemate. A board member brokered a meeting with the premier of Alberta so that the museum could make the case for repatriation directly. It was risky; they were flagrantly ignoring the chain of provincial command. But the gamble worked. In 2000, the First Nations Sacred Ceremonial Objects Repatriation Act was passed in the province of Alberta. The bundles went home. That is the power of transformative relevance.